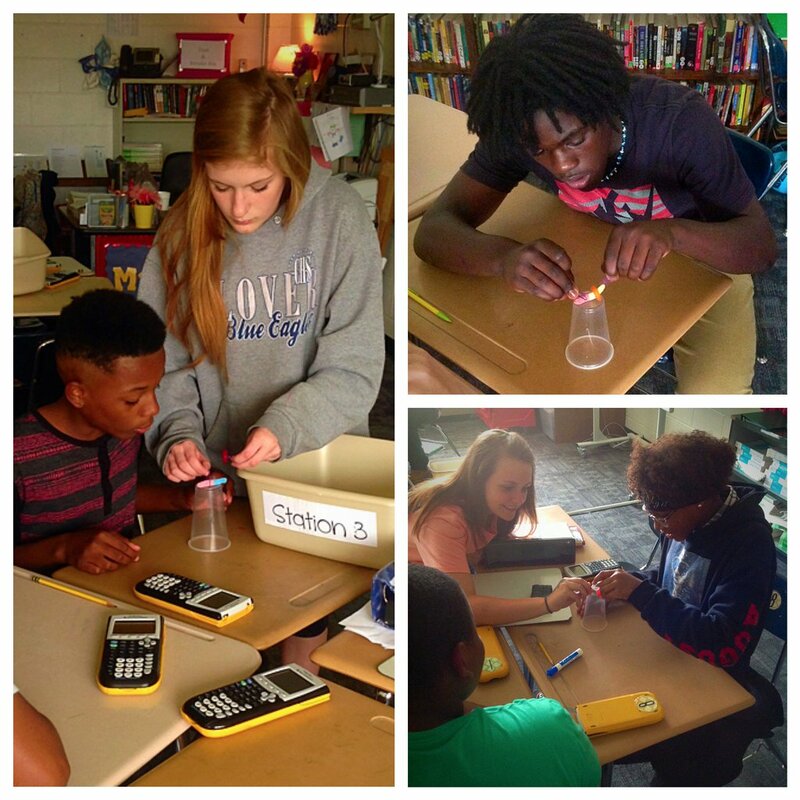 My 8th Grade World: Closing Out The Year...STEM Style! Closing Out The Year...STEM Style! It's Summer Time and we've only been out of school for 18 "school" days (week days) and it would be an understatement to say that I'm going a little stir crazy already. My husband (Zack) has been busy with basketball ... he's the JV and one of the Assistant Coaches for Clover High. They've had practices, little kids camp, scrimmages, and even team camp at Presbyterian College this month. So needless to say...we haven't gotten this vacation train started yet and this girl is about to lose it being home all the time! If it were any other school year...I would totally use this free time to get some major things completed in my classroom. 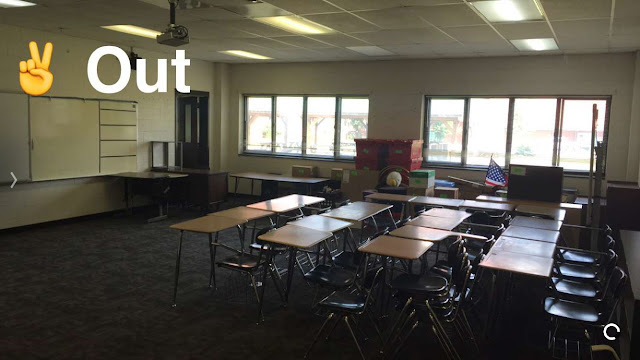 I would be all about the re-do class library, bulletin boards, filing, decorating...the whole shebang! However...before "leaving" for the summer, all teachers at Clover Middle had to be packed up and ready to move to our fabulous new school which is currently still being built! So this girl is hung-out-to-dry..with nothing to work on! Moved out of the old room...not quite ready to be moved into the new room. This is torture! My room all packed up and ready for the move! This activity came from this Pinterest post and I fell in love while reading it! I did slightly change the materials for my students...I don't always trust 8th graders with a hot glue gun :) I kept the same number of Popsicle sticks, rubber bands, and water-bottle lids, but I did switch from a hot glue gun to a roll of Scotch tape and instead of conversation hearts, I gave groups a pack of Smarties. 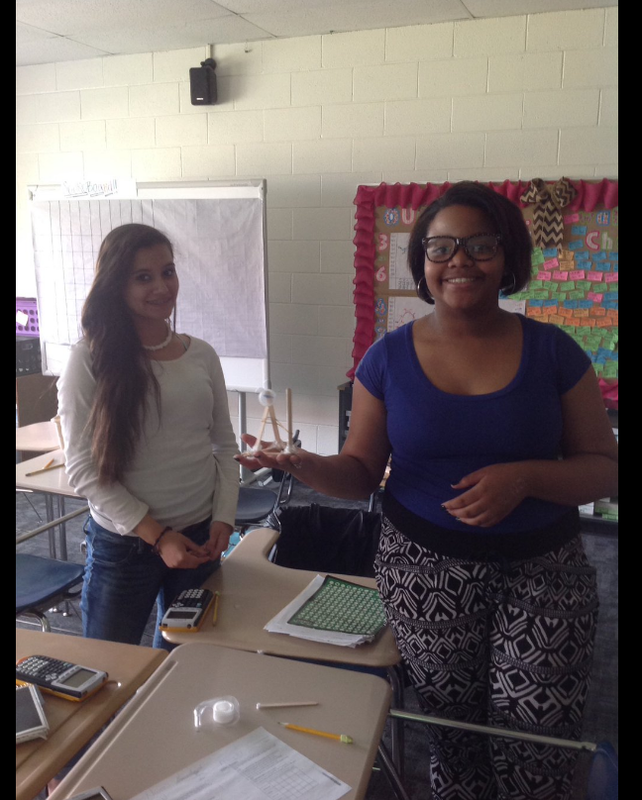 All students were given were the materials, directions saying they needed to create a catapult that would launch a Smartie the farthest distance, and a forty-minute time limit. Students were then on their own! The farthest Smartie flew a little less than the entire width of the classroom. It was pretty impressive! As Monday's activity...This one also came from a Pinterest post. Our class schedules were a little crunched this day because of a school-wide performance in the afternoon, so this STEM activity was great for a quick lesson. Materials only included 15 Pipe Cleaners for each group. Directions told students they could only use the Pipe Cleaners and wanted the tallest free-standing tower given the twenty minute time limit. Again, students were left alone until the timer rang! 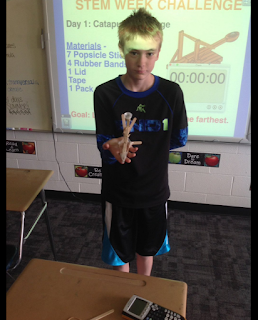 Our tallest tower ended up 19.5 inches tall! Students really enjoyed this quick activity! I have to say...this activity was by-far my favorite! And not just because it involved gummy lifesavers and worms! This activity I feel really got students thinking the most, communicating with each other, and really brainstorming various strategies. You know it...this came from a Pinterest post! 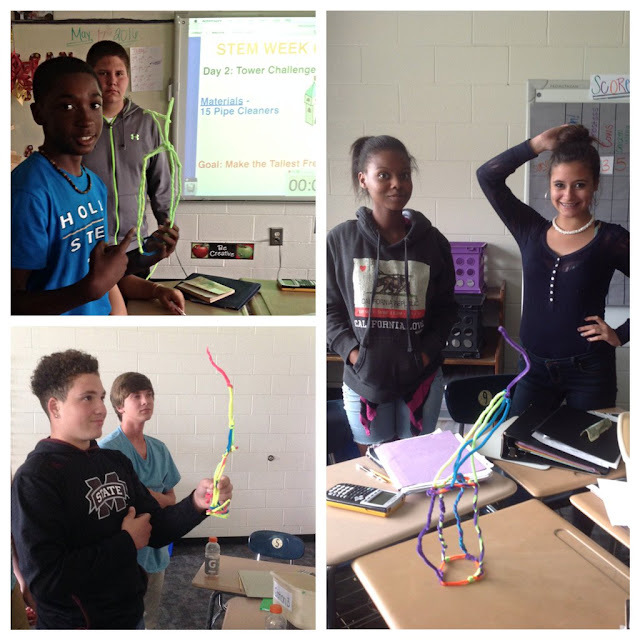 This activity gave students two paper clips, a plastic cup, one gummy lifesaver, and one gummy worm. Mrs. Blocker (my co-teacher) and I set up the challenge with the lifesaver under the upside-down cup and the worm on top. Directions told students to save gummy worm Freddie by putting his gummy life vest around his middle using only the two paper clips and not allowing Freddie to touch the "water" (desk). Most challenging aspect...Students weren't allowed to use their hands! The only thing they could use to touch the worm, lifesaver, and cup were the two paper clips. This activity had a wide range of finishers! Not only were students racing against each other...but they needed to keep Freddie nice and healthy. They couldn't save Freddie if they were also stabbing him! There was a race for the quickest to save Freddie, along with preserving both Freddie and the lifesaver! Our quickest finishing group was finished within 3 minutes! Unbelievable! Most groups took about 12 minutes, with our last group finishing around 18 minutes. This activity didn't come from Pinterest (surprise, surprise!) but it did come from Google. Check out the instructions, worksheets, score sheet, etc. here! 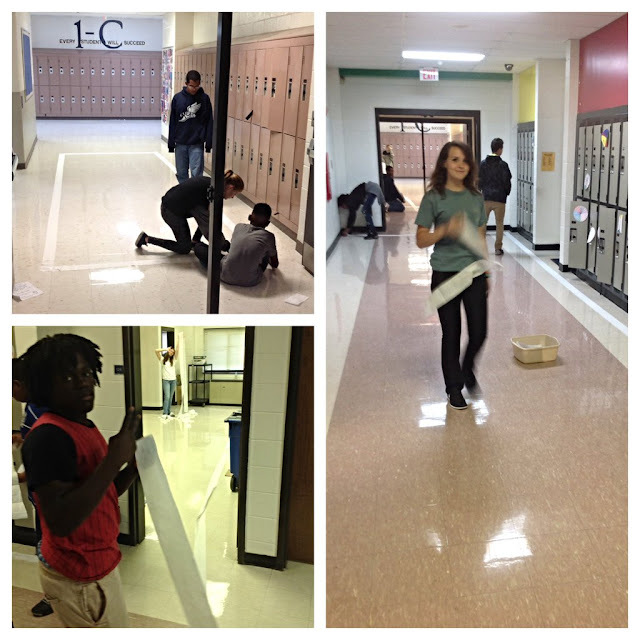 Students were given a roll of toilet paper, a tape measure, and tape. Directions were to make a shape that had the largest perimeter and area within the thirty-minute time limit. Along with the perimeter and area directions, students were told that they had to have the shape closed in, meaning all sides had to be touching another side. There were no gaps to be found in their shapes! This was the end of our STEM week challenges since we were out of school on Friday. Students absolutely loved this week and all the daily activities. They even wanted to continue to challenges into the next week! It was a great experience not only for the kiddos..but for me too! This will definitely be in a bag-of-tricks throughout the school years to come! You know we came in first! !